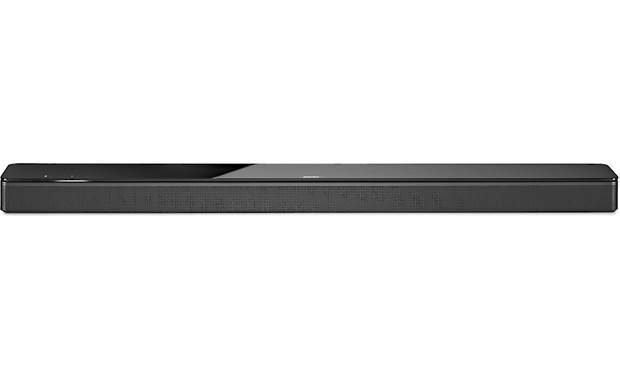 It can be hard to make a sound bar that stands out from the crowd, but that was Bose's aim with the Soundbar 700. 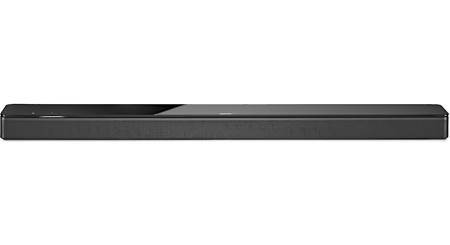 It can be hard to make a sound bar that stands out from the crowd, but that was Bose's aim with the Soundbar 700. In their own words, it's “designed to be the world's best soundbar.” That's a bold statement, so you can bet I was excited to try this one out. Spoiler alert: I loved it. The contextual remote only illuminated the buttons I needed to control the music I was playing over Bluetooth. So cool! The Soundbar 700 makes a good impression before you even plug it in. It feels very well-built, and the metal grille and tempered glass top are lovely. Even the remote control is a thing of beauty with its soft-touch exterior and contextual buttons (that means the remote only lights up the buttons you need for the task at hand). But how did it sound? I really wanted to put the Soundbar 700 through its paces so my test movie was Thor: Ragnarok. When Led Zeppelin's “Immigrant Song” kicked in near the beginning of the film, I knew this sound bar would not disappoint. I was impressed with the depth and clarity it brought to both the movie effects and the soundtrack music. Want your sound bar to tell you a joke, provide a weather forecast, or just turn up the volume on your favorite song? No problem. The Soundbar 700 has Amazon Alexa built right in, with a custom-designed eight-microphone array so Alexa can hear you no matter how loud your music is. The light bar on the front makes it easy to see when Alexa is listening, thinking, or speaking. The Soundbar 700 has built-in Bluetooth® and Wi-Fi® for practically endless wireless music options. Apple® AirPlay® 2 functionality is planned for early 2019. But in the meantime, dip your toe in the waters of whole-home audio with the Bose Music App. You can wirelessly stream online music services like Pandora® and Spotify® to your sound bar. Expand your system into other rooms by picking up a Bose Home Speaker 500 or two. You can group and control all your Bose smart speakers from the same app. Want an even more immersive experience? Add a pair of wireless Bose Surround Speakers. These compact speakers work seamlessly with this system to deliver complete wraparound sound effects. Bose also offers the optional wireless Bass Module 700 — the most powerful one they've ever made. It communicates wirelessly with the sound bar to add oomph to everything from action movies to dance mixes. Can you turn of the Alexa feature? Yes you can turn off Alexa. 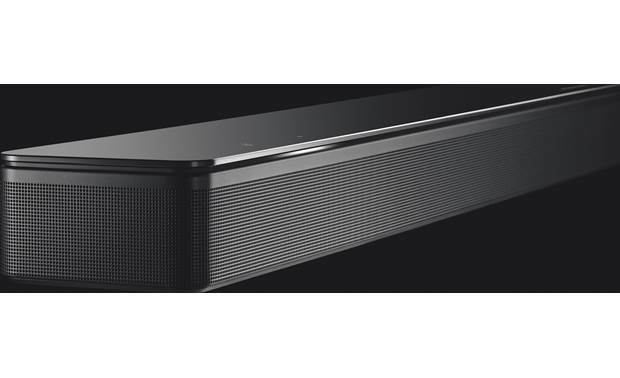 Bose Premium Sound: The Bose Soundbar 700 utilizes a proprietary DSP-controlled amplifier and custom-designed low-profile transducers to deliver exceptional detail and depth with crystal clear dialogue. Proprietary PhaseGuide technology works with the tiny transducers to direct beams of multi-directional sound, delivering an unprecedented level of spaciousness. QuietPort technology is integrated into the soundbar with recessed ports that use a piece of resistant screen to reduce turbulent noise while getting more sound through a smaller opening, resulting in virtually distortion-free bass from a slim profile speaker. ADAPTiQ Audio Room Calibration: ADAPTiQ audio room calibration will optimize the Bose Soundbar 700's acoustic performance for the unique characteristics of your room, giving you the best possible listening experience. Through the Bose Music App and the included headset, ADAPTiQ audio calibration customizes the sound of the system to the acoustics of your listening area by taking five audio measurements. During ADAPTiQ audio calibration, a microphone on the top of the ADAPTiQ headset measures the sound characteristics of your room to determine optimal sound quality. To run ADAPTiQ, you will need 10 minutes when your room is quiet. Optional Wireless Surround: The Bose Soundbar 700 supports wireless rear speakers and a wireless bass module from Bose (both sold separately). 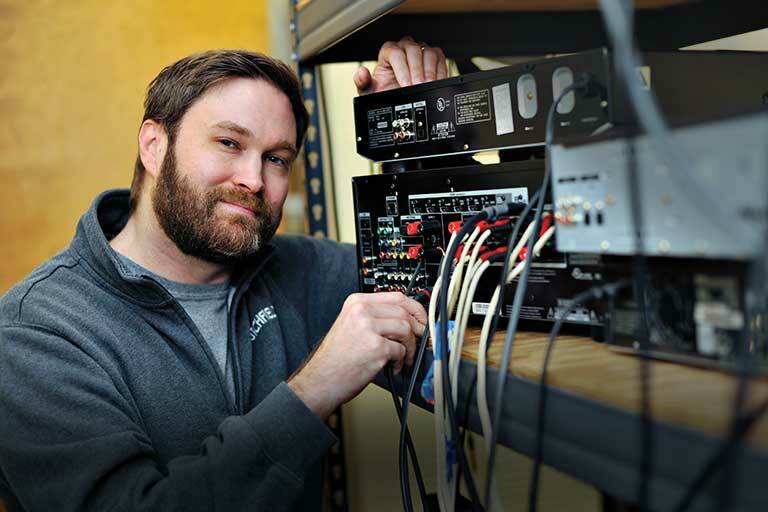 Bass Module: The Bose Bass Module 700 (sold separately) adds deep, thunderous bass to the Bose Soundbar 700. 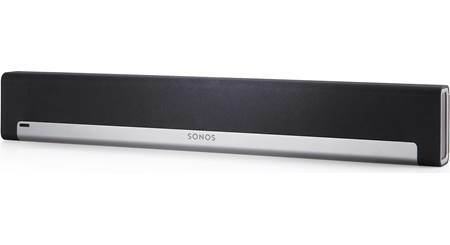 It connects wirelessly to the soundbar speaker and has a wireless range of approximately 30'. Its compact, cube design fits well in any room. The Base Module 700 can be placed almost anywhere in your room, but placing it on the same wall as the soundbar will provide the best performance. The wireless sub will require AC power. There is also a mono-minijack output on the back of the Bose Soundbar 700, if you prefer to make a hardwired connection to the Bose Bass Module 700. Surround Speakers: For a fully immersive sound experience, add the Bose Surround Speakers (sold separately) to the Bose Soundbar 700. With a wireless range of about 30' and standing less than 4" high, these wireless surround speakers blend nicely into your room. The speakers should be placed behind the main listening area, one on the left side and one on the right of the room, for optimum sound quality. Both speakers will require AC power. HDMI ARC Jack: The Bose Soundbar 700 is equipped with a single HDMI ARC jack to connect the soundbar to your TV's HDMI ARC input. The HDMI ARC jack allows audio from your TV to be sent through the soundbar speaker. The unit supports Dolby Digital (up to 5.1ch), DTS (up to 5.1ch), and 2ch PCM audio. Optical Digital Input: If your TV is not equipped with an HDMI ARC jack, the Bose Soundbar 700 also features an optical (toslink) digital input that supports 2ch PCM and 5.1ch Dolby Digital or DTS. This soundbar does not offer analog audio inputs. 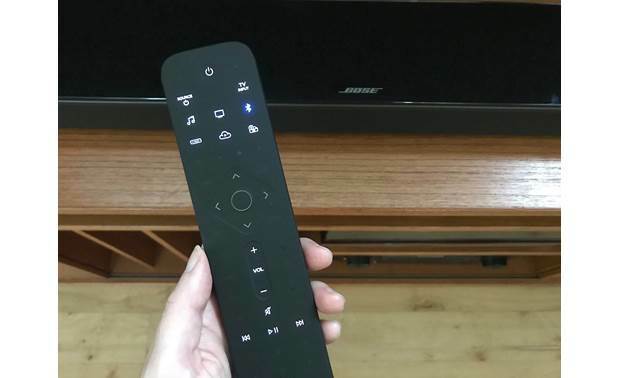 Remote Control: The Bose Soundbar 700 comes with a universal Bluetooth LE remote control and supports HDMI-CEC. You can also program 3rd party remotes (sold separately) to control the soundbar system. Universal Remote: The included universal Bluetooth LE remote control provides wireless operation of the soundbar speaker system without direct line of sight. You can also program the universal remote to control your TV, Blu-ray player, or cable/satellite box. The remote is designed sleek with a premium aluminum accent and seamless elastomer keypad that's soft to the touch. The remote's ingenious contextual backlighting only shows you buttons relevant to the task at hand. Whether you're listening to music or watching TV, the remote automatically adjusts itself to light up buttons you need in that very moment. The Bose Music app on your Apple iOS or Android device will be used to pair the universal remote with the Bose Soundbar 700. 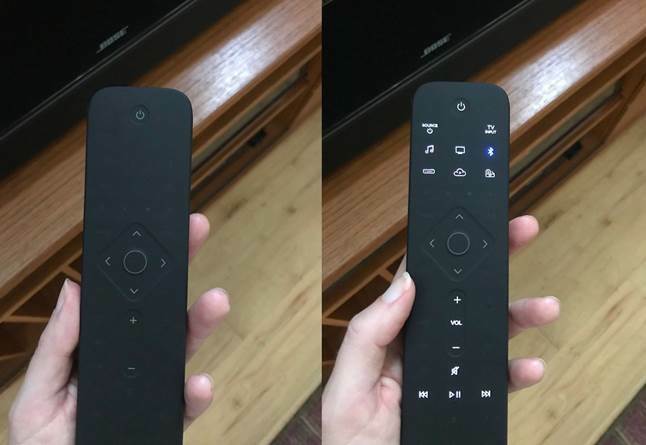 3rd Party IR Remotes: Because the Bose Soundbar 700 also supports IR commands, you can also program a third-party IR remote, such as your cable/satellite box or TV remote, to control the soundbar. Refer to your third-party remote owner's guide or website for instructions. Not all third-party remotes are compatible with the soundbar. The 3.5mm IR input on back of the Bose Soundbar 700 allows you to connect an IR extender (sold separately) in case the soundbar's IR receiver is obstructed from view. Placement Options: The Bose Soundbar 700 uses the reflective surfaces of the room to deliver a spacious home theater experience. To ensure optimal audio performance, the soundbar should be placed equidistant from each side wall and directly in the "front-center" of the TV. 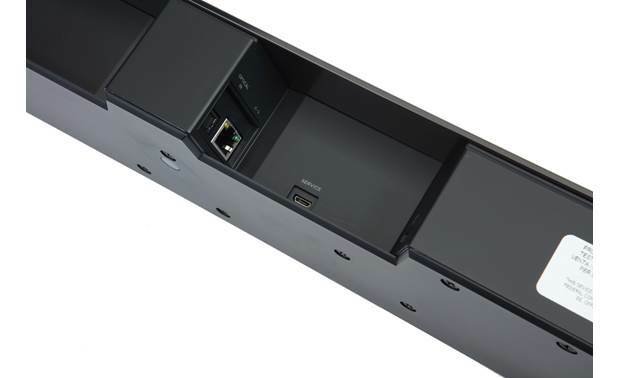 No objects should be placed in front of the soundbar, nor should it be placed recessed inside a cabinet, as this would result in a limited sound stage. Also, nothing should be placed directly on either side of the Bose Soundbar 700 since there are side-firing transducers located on either side. Optional Wall Bracket: The Bose Soundbar Wall Bracket (sold separately) has been designed specifically for the Bose Soundbar 700 and hangs the soundbar speaker horizontally above or below your flat-panel TV. A cable cover is included to help hide the HDMI and/or optical cable that is run from your TV to the Bose Soundbar 700 speaker. The Bose Soundbar Wall Bracket features high-quality steel construction and is available in a black or white finish. AC Power: The Bose Soundbar 700 operates off of standard household current using the supplied 5' detachable AC power cord. Multiroom Audio: The Bose Soundbar 700 is part of a new family of Smart Home speakers and soundbars from Bose that can be used to create a wireless multiroom audio system over your home's WiFi network. 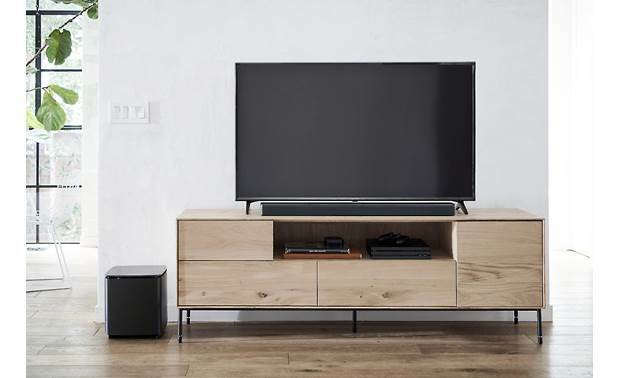 You can start with one Bose Soundbar 700 and add more Bose Smart Home speakers and soundbars to create a wireless multiroom audio system in your home. 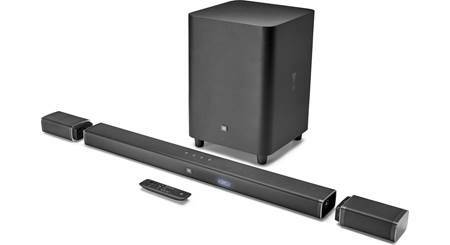 Wired or Wireless Network Connection: The Bose Soundbar 700 offers a wired (Ethernet) or wireless (WiFi) connection to your home network. 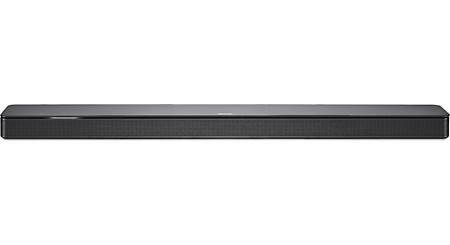 The Bose Soundbar 700 is equipped with an Ethernet R-J45 jack and built-in, dual-band (2.4/5GHz) WiFi (802.11 b/g/n). The system's network connection can be setup initially from the Bose Music app on your compatible Apple iOS or Android OS device. Multi-Room/Multi-Source: The Bose Music app lets you control one or multiple Bose Soundbar 700, Bose Soundbar 500, and Bose Soundbar 700 in your home. You can play the same music throughout your home or listen to different music in different areas. Built-In Alexa with 8 Microphone Array: The integration of Alexa with the Bose family of Smart Speakers will support the vast majority of Alexa functionality; including music playback, control of smart home devices, setting timers and alarms, and general information requests. A custom-designed, proprietary 8 microphone array on the soundbar is precisely positioned for accurate near-field and far-field voice pickup. You can rest assured that the Bose Soundbar 700 will hear you even when there is a lot of noise in the background, your music is playing loud, or you are across the room. Smart Home Skills: Various Alexa smart home device skills work through the Bose Soundbar 700, its built-in microphones and the integration of Alexa. For example, you can ask Alexa - "set my smart thermostat to 72 degrees" or "turn off the lights". The microphones on the Bose Soundbar 700 may be turned off with a single tap of the microphone off button on the top of the speaker. This button completely cuts power to the microphones so Alexa will not hear any commands. For security reasons, it is not possible to use a voice command or the Bose Music app to turn the microphones on or off; only a physical button press can control the microphones. When the microphones are off, this button will always be backlit with a red LED light. There are certain Alexa skills that the Bose Soundbar 700 does not support; such as Alexa Calling & Messaging. Alexa is not available in all languages and countries. Online Music Services: The Bose Soundbar 700 can play music directly from streaming music services over WiFi, controlled either by the Bose Music app (for Apple iOS and Android), or Amazon Alexa through the built-in microphones. These music services can be controlled from the Bose Music App (for Apple iOS and Android) and Alexa through the built-in mics. Basic playback functions such as Play/Pause & Previous/Next Track can be done from the included IR remote. 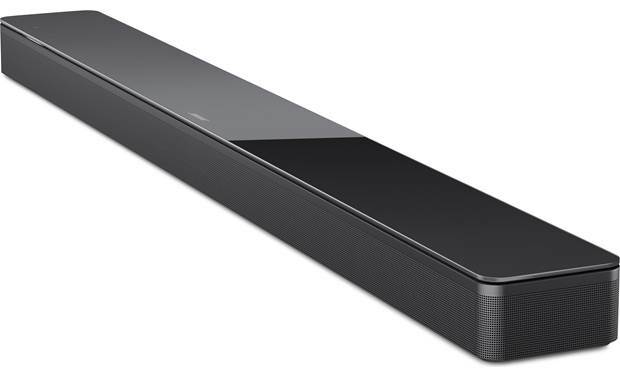 The Bose Soundbar 700 does not support Bluetooth hands-free communication for making or answering phone calls. AirPlay 2 (future firmware update): Through a future firmware update (no ETA), the Bose Soundbar 700 will support AirPlay 2. AirPlay 2 is an advanced and easy-to-use wireless multiroom audio platform for iTunes, Apple Music, and other compatible Apple iOS apps. With AirPlay 2 you can play any sound from your Apple iOS device (running iOS 11.4 or later) or Mac computer (running OS X 10.13.2) on the Bose Smart Home speaker system and other compatible AirPlay 2 speakers throughout your home. You will also be able to ask Siri-enabled devices (like your Apple iPhone, iPad, or Watch) to control playback of your Apple Music on the Bose Soundbar 700. You can choose to play audio in one room, play the same audio in grouped rooms, or play the same audio in every room (you can control and group directly from Apple's Music App and Home app on your Apple iOS device). You can even watch videos and movies from YouTube and Netflix on your compatible Apple iOS device or Mac computer with perfectly synced audio on the Bose Smart Home speaker system. Network Standby: The Bose Soundbar 700 transitions to Network Standby when audio has stopped and you have not pressed any buttons for 20 or more minutes. To wake the speaker from network standby, simply tap any button on the speaker, play/resume audio using your mobile device and the Bose Music app, or talk to Alexa. Is there any way I can adjust the equalizer settings on my Bose 700 sound bar? I got the bass module 700 plus the rears. I feel like it lacks bass even with the bass module. Thanks! Does the 300 or 700 need room or space on either end? My tv stand's open enclosure measures 39 inches wide. Searches related to the Bose® Soundbar 700 Powered sound bar with Wi-Fi®, Bluetooth®, and built-in Amazon Alexa.